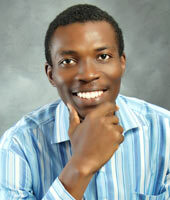 Paa Kwesi Inkumsah, Ghana (Accra) Chapter Coordinator, is a passionate enthusiast of personal development. A social entrepreneur, he explores his skills and talents to create and share inspiration through his writings. Paa Kwesi served as president of JCI Ghana in 2009. In 2010 he was appointed to serve as JCI UN affairs commissioner for Africa and the Middle East. He is also the co-president of International Institute for Global Education, an institute with a unique curriculum of studies to create effective global leaders.